In the May 15 issue of CityBeat, I wrote about Tiki Taka Grill, an unusual restaurant in an obscure Hillcrest strip mall featuring Israeli cuisine that is likely unfamiliar to the large majority of San Diegans or, for that matter, Americans. One Israeli dish that might be familiar to many Americans is hummus, a “meze” that’s ubiquitous throughout the Middle East. Israelis, though, do a particularly good version. The secret to good hummus lies in resisting the urge to grab the can. While canned chickpeas are a better product than most other canned beans, they lack the inherent sweetness and more subtle flavor profile of the dried bean. Another key to my hummus is the garnish: a paste concoction involving bit of acid, a helping of heat and something herbaceous. I chose to go with Za’atar, a spice mixture borrowed from the Palestinians that has become very nearly the national flavor of Israel. Za’atar can be obtained at most Middle Eastern grocers (North Park Produce and Vine Ripe are excellent options). If you can’t find Za’atar, feel free to substitute dried oregano or fresh parsley. You could also choose to go with just a sprinkle of paprika. 1. Soak the chickpeas: In a medium bowl, cover the dried chickpeas with 2 inches of water and stir in the baking soda. Refrigerate overnight. Drain and rinse under cold water. 2. 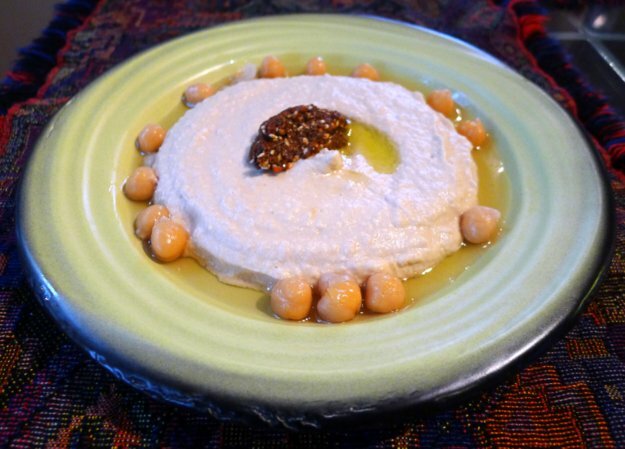 Cook the chickpeas: In a medium saucepan, cover the chickpeas with 2 inches of fresh water. Add garlic cloves and bring to a boil. Simmer over low heat until the chickpeas are tender, about 40 minutes. 3. Make the garnish: Combine all of the garnish ingredients in a bowl and refrigerate for an hour to let the flavors come together. 5. Plate the dish: Spoon 3-4 tablespoons of the hummus onto each plate, leaving an indentation in the middle. Fill the indentation with a bit of olive oil and pour some of the garnish mixture over the olive oil. Spoon some of the reserved cooked whole chickpeas and remaining cooking liquid around the hummus at the rim of the plate.